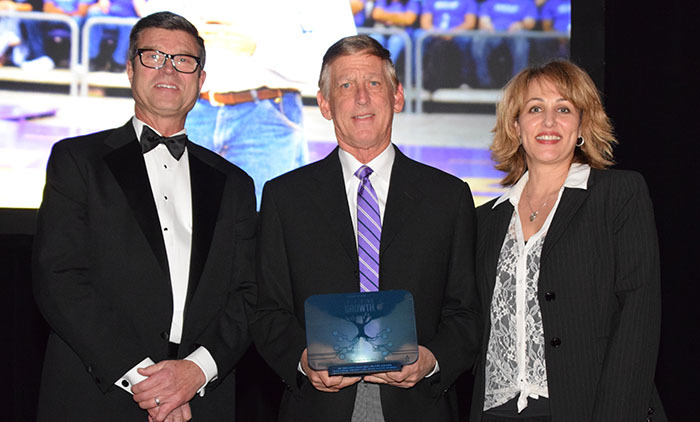 GCU President Brian Mueller (center) holds the Business Leader of the Year Award, which he received from Steven Zylstra (left), president/CEO of the Arizona Technology Council, and Sandra Watson, president/CEO of the Arizona Commerce Authority. An event on Thursday night at the Phoenix Convention Center made it easy to see why Grand Canyon University has placed such an emphasis on technology education. 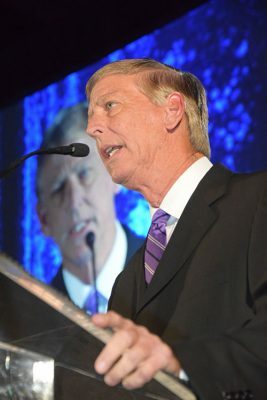 Steven Zylstra, president and CEO of the Arizona Technology Council, said it’s easy to see why GCU President Brian Mueller has made that push successful. Mueller speaks to the audience after receiving the award. The occasion was the Governor’s Celebration of Innovation, where Mueller received the Ed Denison Business Leader of the Year award. Afterward, Zylstra recalled a 2008 meeting that occurred soon after Mueller came to the University. Mueller, who flew back to Phoenix from Colorado late Thursday afternoon to be at the ceremony, reflected on how much has happened since he took over. “It’s really the culmination of a lot of people working really hard at a very innovative concept that has exceeded all our expectations,” he said. “We had big plans. It was a major risk that we took. But it’s an amazing example of how, when you bring a group of people together and you trust that God will be in your efforts, here’s what can happen. An important part of the equation, Mueller added, is the fact that 70 percent of GCU students are studying in science, technology, engineering and math (STEM) fields as well as business and entrepreneurship. That puts the University in step with what Arizona Gov. Doug Ducey is trying to accomplish. “It’s a state that has shown it’s open for business, especially in science and technology,” Zylstra said in his opening remarks at the event Thursday, adding that venture capital investments in the state were $123 million in the first half of this year, $4 million more than all of 2015. Sandra Watson, president and CEO of the Arizona Commerce Authority, said that on a recent trip to the San Francisco Bay Area’s Silicon Valley, all the talk was about what’s happening tech-wise in Arizona. “We are becoming recognized around the country as a hotbed of entrepreneurial activity,” she said. It was particularly inspiring to listen to the projects of the four high school students who were honored as the Future Innovators of the Year. The only thing more complicated than the names of their projects, such as “The Effect of the Algal Extraction Method on the Amount of Crude Lipid Recovered for Economically Feasible Biofuel Production,” is how they went about fixing the problems. Zylstra is working with GCU leaders, especially Dr. Michael Mobley, executive director of the Center for Integrated Sciences, Engineering and Technology, to help bring students like that to the University and challenge them with cutting-edge programs. But, he said, he knows where the tech push originates at GCU. And Mueller is bullish on making that continue for GCU in particular and the state in general.